Get affordable Security Camera Installation on El Segundo, CA and CCTV equipment with commercial quality and 2 years warranty. We have been working on El Segundo, CA since 2005. A residential security camera system or commercial security camera system are becoming more and more important due to the increasing on crime. They are able to provide us with live video, or recorded. In fact, CCTV systems video footage provide us of undeniable video evidences that have led to the incarceration of criminals. Also the market of security cameras have increased due to the advancement of CCTV technology, they now come in many shapes and sizes and various HD resolutions. There are wired security cameras and wireless, making possible to install them anywhere. 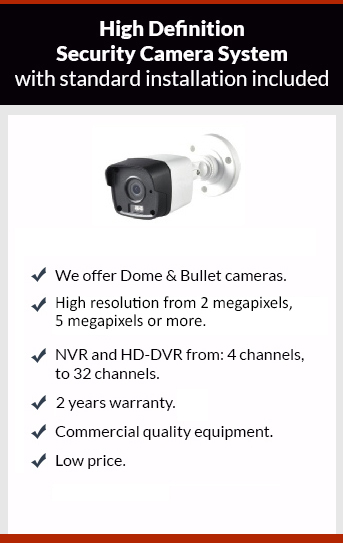 Protection4less will provide you with the best CCTV solution for your home or business at a low price. Give us a call to get your appointment to get your free estimate.